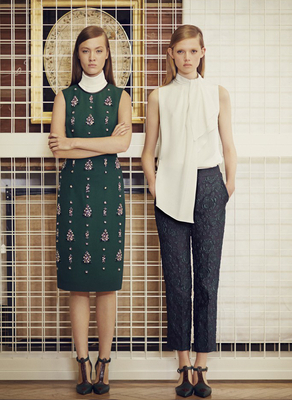 The Erdem pre-fall 2014 collection features a multitude of romantic, ultra feminine ensembles. It seems that the focus on asymmetry and androgyny we've seen in the brand's spring 2014 collection was just a temporary experiment, as the label has returned to the elements it's most comfortable with, bringing several stunning ensembles which can instantly make fashionistas fall in love. A surprising thing about the new line is that the designer actually found inspiration from John Currin’s subversive paintings, given the fact that there's nothing subversive about the new options. 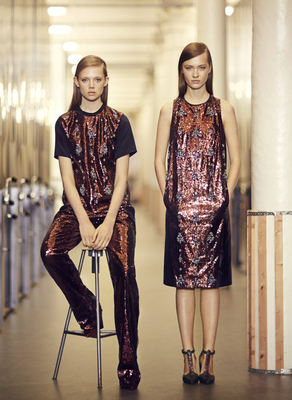 The dresses featured in Erdem's pre-fall 2014 collection seem to display mid and late '60s influences. The designer, who recently won the Red Carpet Award at the 2013 British Fashion Awards, opted for simple shapes, but used intricate lace embroideries, stunning metallic accents and a multitude of floral prints to add complexity to the new options. Metallic accents are without the doubt the element of surprise in the new Erdem pre-fall 2014 line, especially since the brand opted for head to toe metallic outfits on numerous occasions, a trend the designer didn't explore in Erdem's fall 2013 line, when the metallic trend was extremely popular on the runways. Sporty accents also manage to make their way into the new line. Glammed up jeweled tees and reinterpreted varsity jackets are just a few great choices for those who want to experiment with something other than pretty dresses for occasions which require a certain dress code. These options are a nice variation of the label's uber feminine looks. Color-wise, the new Erdem pre-fall 2014 collection revolves around stunning jewel tones and pretty pastels, suitable for different seasons. The label's options are designed to steal the spotlight instantly although the accessories are kept at a bare minimum. Chic pointy toe shoes and quirky sunglasses are the only accessories the label uses to complete the elegant ensembles from the pre-fall 2014 collection.